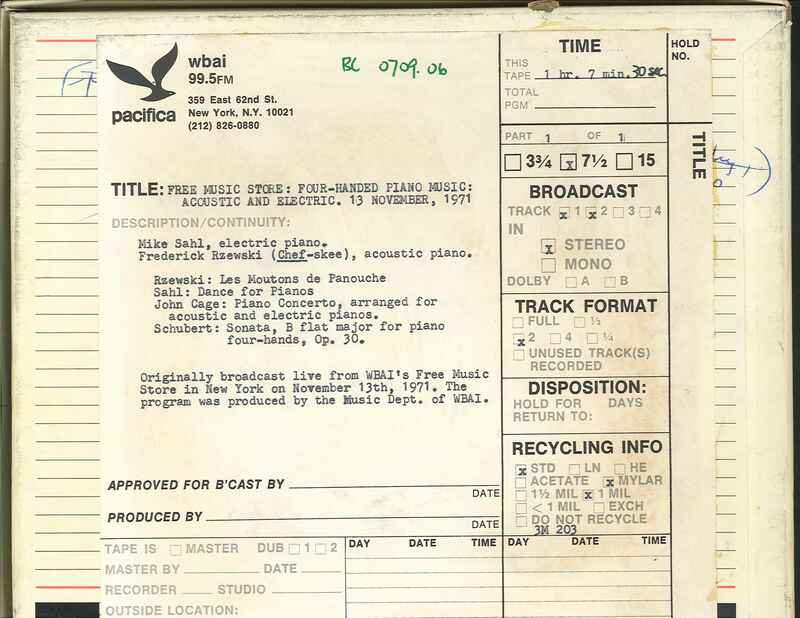 Mike Sahl (1934-), electric piano, and Frederic Rzewski (1938-), acoustic piano, perform live at WBAI's Free Music Store on November 13, 1971. The pieces performed include Les Moutons de Panurge by Frederic Rzewski; Dance for pianos by Mike Sahl; Piano concerto by John Cage (in a version for acoustic and electric pianos); Sonata in B-flat major for piano four-hands, op. 30 by Franz Schubert; and selected short subjects. WBAI's Barbara Oka concludes the program with an announcement. This recording was formerly cataloged as BC0709.06. Some distortion on the higher notes throughout the recording.